We’ve got the perfect handmade card design for you to give to your loved ones this Valentine’s Day. This heart sunburst design can be cut by hand with a craft knife, or you can create the project using a Cricut machine alongside its online software Design Space. Adhere the finished papercut design to the front of a card to for an eye-catching handmade Valentine’s card! You can create this card in any combination of papers and lettering, but we opted for the stunning (and shimmery) First Edition Wanderlust papers for ours. We really like that there’s a bit of added dimension from the heart topper and adhesive letters too! This is such an easy card to create - we’ve provided a free template to help you with your papercutting, but you can also upload the template to your Cricut Design space and let your Cricut cut the design out for you. 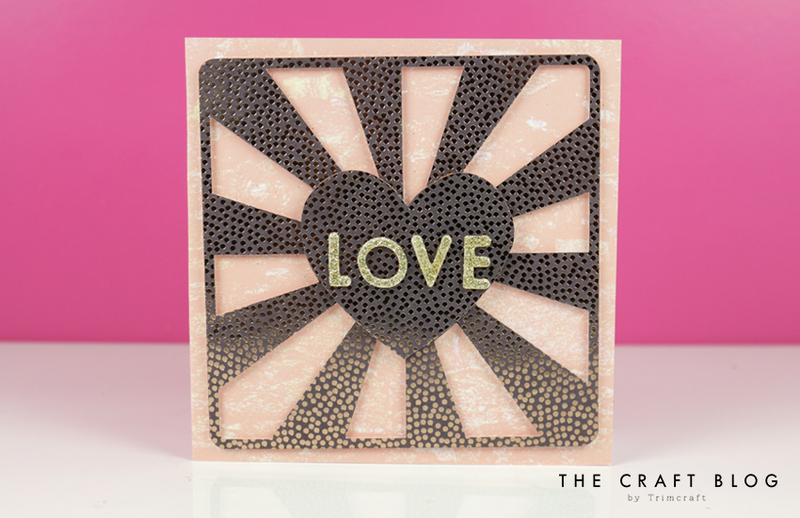 To create your eye-catching handmade Valentine’s Card, follow our step-by-step to create this lovely papercut design. 1. Place your free template on top of your chosen 6” x 6” Wanderlust paper. Secure it by adding a few strips of Washi Tape while you cut. 2. If cutting by hand, use a craft knife and start from the centre of the design and work your way out, ensuring to follow the black lines on your template. Alternatively, you can upload the template to your Cricut Design Space as a cutting template, then sit back and let the Cricut Air machine cut the template out for you. Once done, use the Cricut spatula tools to carefully peel off the design from your mat. 3. Adhere a contrasting sheet of the 6” x 6” Wanderlust paper to the front of the card blank. 4. Using foam pads, adhere the papercut design to the front of your card. 5. Follow the above steps again to create a second papercut, but this time, remove all of the design but the heart in the centre to create a topper. 6. Adhere the heart on top of the previous design using foam pads to create dimension. 7. Adhere the Simply Creative alphabet letters to the centre of the heart – we chose to spell the word ‘Love’ but you can personalise your card how you like. Your handmade card is now complete and is ready to wow your loved ones with! How will you be using our papercut design? We’d love to see don’t forget to #trimcraft when uploading to social media and to share your makes in the Inspiration area! Is there anway of saving this In a favorites folder or something In my inspiration tab on here?